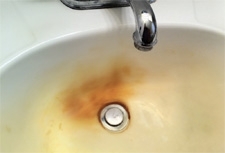 Let’s face it, if your home’s water is leaving behind rust stains or smells like rotten eggs it can be unpleasant to do everyday tasks like shower or brush your teeth. Fortunately, your Central Coast Culligan Man® is eager to help you tackle even the toughest water problems. With over 65 years of experience in the region, Culligan is the area’s water expert and understands the problems facing your community’s water. Remember, the only way to be sure of what’s in your water is to have it tested, and Culligan offers everyone a FREE water test. We will send your local Culligan Man out to your home to test your water. Whether ridding your home of water that smells like rotten eggs or removing stain-causing iron from your sinks, Culligan has the tools and experience to take care of your home’s water needs. To be contacted by your local Culligan Man, just fill out our form or pick up the phone and call your local dealer's number.